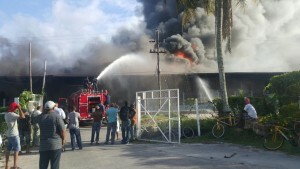 A fire was Monday afternoon raging at several bonds at Gafoor’s Hardware Store, Houston, East Bank Demerara. The cause of the fire was not immediately known. He confirmed that the bonds contain a lot of combustible items such as tires and paints. Gentle said there were no immediate reports of injuries. The blaze started just after 16:00hrs lasted for close to three hours as firemen were unable to compete with the burning rubber and other highly combustible material. Reports reaching Demerara Waves indicate that the owner, Sattaur Gafoor and some 50 employees were in the building at the time the alarm was raised. It is understood that the losses would amount to hundreds of millions of dollars.